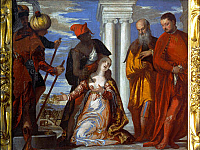 Paolo Caliari (or Cagliari), adopted the surname Veronese from his birthplace of Verona. He was a famous painter of the Renaissance, whose work in Venice was masterful. Among other Venetian artists, such as Titian (1485 – 1576) and Tintoretto (1518 – 1594), Veronese was a leading artist from the city. Emblematic of the Venetian School, Veronese was a superb colorist, painting elaborate narrative cycles in a dramatic Mannerist style. The figures in his works are often described as having the subtle foreshortening of Correggio (1489 – 1534) and Michelangelo’s (1475 – 1564) heroism. He trained early on in Verona at the age of fourteen with Antonio Badile (1518 – 1560) and Giovanni Francesco Caroto (1480 – 1558). His contributions to an 1543 altarpiece he assisted Badile with show that even at 15 years old, he was well on his way to surpassing his master. He went on to study Mannerism in Parma and then to Mantua in 1548, painting frescos for the Duomo there. 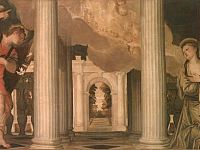 He then settled in Venice, painting his Sacra Conversazione in the San Francesco della Vigna in 1552. Soon, works such as his History of Esther in the Church of San Sebastiano and works in the Ducal Palace and the Marciana Library, gained him regard as a Venetian Master. Veronese is best remembered for his monumental banquet scenes, including his masterpiece, The Wedding at Cana, also, the Feast in the House of Simon and the Feast in the House of Levi. These works were dense with figures and elaborate decorations, rich with color and skilled in their depictions of architecture. Veronese painted many works, including religious and mythological subjects, as well as portraits. Of his works in the Uffizi Gallery are, Holy Family with Saints Barbara and John, Saint Agatha Crowned with Angels, Annunciation, Esther and Ahasuerus, Martyrdom of Saint Justina and, Venus and Mercury present Anteros to Giove. His legacy has spanned centuries, ranked as a master colorist amongst Titian, Peter Paul Rubens, and Rembrandt, sometimes surpassing these masters in his harmony of tones and chiaroscuro. His workshop was an established family of painters, including his brother, Benedetto Caliari (1538 – 1598) and his sons, Carlo and Gabriele.